Following the momentous decision on July 8 by the Church of England Synod to allow women to become bishops, Norwich Diocesan communications director and Bishop's Chaplain Rev Jan McFarlane gives her view. “There” would refer to the debating chamber of the General Synod – the Church of England’s parliament – in York on Monday afternoon and evening. The chamber was crowded, the thunder rumbled ominously in the distance, the feeling of anticipation was tangible and there was a very real sense of history being made. In fact, the General Synod had already decided back in 2005 that, in theory, women should be allowed to become bishops. But on Monday, we were asked to reaffirm that view, and to think through how that might actually be achieved, and how those who cannot accept such a move could still find a home in the Church of England. It was inevitable that the debate would be far from easy. Strong convictions are held on both sides. Would it be possible to even begin to find a way forward? For those with tidy minds, who like their lives to be neat and organised, and who feel that it simply doesn’t make sense to say that women cannot become bishops, the choice from the options set out before us would have been blatantly obvious. Let’s take the simple approach. Women will be bishops – full stop. If you don’t like it, too bad. A good decision if you like a simple life. But fortunately the Church of England is not like that. For the last eight years I have worked closely, in a big church not too far away, with a male colleague who cannot accept the ministry of women as priests, let alone bishops. We work together well, accepting that we hold different views, and even managing some gentle humour and ribbing along the way. Why would I for one moment, despite how strongly I feel about the ordination of women, wish to say to him that he no longer has a home in the Church of England? We rejected that option. At the other end of the scale was the option to find new structures within the Church of England where those unable to accept the ministry of women bishops would be able to take refuge. New dioceses perhaps? Or a dividing up of the diocesan bishop’s oversight and ministry so that a female bishop could be bishop to some but not to all in her diocese. A refuge? Or a ghetto - a “no-go area” for women bishops? This option was the favoured one for many who by this stage in the debate were beginning to feel the ground slipping away from under them. But the majority view was that if we are going to say that women can be bishops, we can’t say that they are going to be somehow second rate bishops. Not “proper” bishops. And I would hope that as I respect the opinion of those who can’t accept the ministry of women, they too might respect my ministry enough not to want to impose those restrictions. We rejected that option, though for many, not without some considerable anxiety and pain. So where did this leave us? With a truly Anglican “middle way”. We could say that because the majority feel that the time is now right for the path to be opened up to allow women to become bishops, we would make that happen. But we would also ask for a Code of Practice to be drawn up which would make provision for those who cannot accept women’s ministry in this way. And that’s what we voted to do. In a sense, it’s a muddle. It’s not a straightforward easy answer. In fact, it’s a bit of a mess. But if that’s what it takes to allow those women who one day may be called to be bishops to be bishops in every sense, and if that’s what it takes to keep those who, on grounds of conscientious objection cannot accept that move, and who otherwise might feel forced to leave, still to be able to find their home in the Church of England, then muddle on we will. I’m writing this late in the evening having just walked in through the door after a long journey down the A17 from York. I feel a bit battered and bruised. It was a gruelling eight-hour debate. Emotions were running high and brains needed to be fully engaged to grapple with the implications of our actions. By the end of the evening, there were casualties. If it’s not too dramatic an analogy, I feel a bit as if I’ve been involved in a car crash and I’m still struggling to step away from the wreckage. There’s a sense in which nobody really got what they wanted. Everyone had to compromise, everyone had to work hard to remember that the Jesus who gives us the name ‘Christian’, modelled a life of graciousness and generosity and calls us to do the same. But as a church we believe in new life from brokenness. That, after all, is what Easter is all about. And early on Tuesday morning, as we gathered in that same debating hall to break bread and share the cup of wine, there was a real sense in which something new was already happening. Women’s ministry was at last being affirmed. And those who can’t accept it can still, if they will, find a home. There’s still much to do – a very long way to go. But we’ve taken those first history-making steps. And by the time my seven year old niece is revising for her Religious Education GCSE, the Church of England might just well be preparing to ordain its first women bishops. 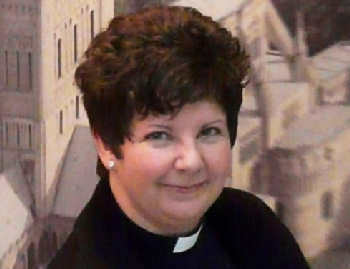 Click here to read more about Jan becoming the first female archdeacon in the Norwich Diocese. I agree with all you have stated and I wish the Telegraph would stop being so anti Church. It doesn't really matter. The church of England is dying on its feet and living in a leadershipfree zone. rubbish Hary...the church is NOT dying on its feet but rather is alive and kicking! Unfortunatley the COE is just not my cup of tea. Much of it seems to be stuck in the past. Our God is one of the past, the present and the future but much of the COE seems to think we need to stay in the past. Why stick with singing worship songs written 100 years ago. Church organs and hymns may have been cutting edge and fantastic when they were invented but culture has moved on. Church numbers dwindling and average age of congregation rising what does that tell you? I have heard some great sermons in COE services but great preaching needs to be supported by relevance. I am not questioning the faith or heart of people within the COE just sometimes the methodology. If we insist on wearing clothes and singing songs from a previous era we may as well speak in YE OLDE ENGLISH as well and make the whole experience foreign and uncomprehensible. Society's image of the Church is one of outdated stuffy christians singing ancient songs and wearing their sunday best. Unfortunately this is a real turn off for most non-christians and one that makes a lot of people turn away and ignore God's life changing message. Please let me clarify - i think the COE does some fantastic work in the community. This is not a post to start a whole lot of church bashing. I would just like to see the church modernise and become more relevant to today's society. The word of God has the power to change lives but... if people aren't open to the word then it will not and we may as well stand on a street corner with a billboard (we all know how much good that does) Bring people to a place where they are more comfortable, where they can relate to what's going on and people will be more willing to listen to what's being preached rather than completely switching off. We have to change people's perceptions of church being irrelevant. The church is not peripheral to the world.